Deep beneath the Blakros Museum lies a copper gate that no key could open—at least, not from the outside. To the horror of museum curator Nigel Aldain, the gate has begun to writhe and buckle. Whatever lurks beyond it will not remain contained for much longer. Aldain sent an urgent request for aid to Zarta Dralneen, leader of the Dark Archive faction. Dralneen quickly realized that protection would require a divided approach, with some remaining behind to guard Absalom from what pours out and others charging in to deal with the source. With the support of Aldain, Dralneen, and Venture-Captain Ambrus Valsin on guard behind them, the PCs rush beyond the twisted portal. Within, they uncover the true reason why the ancient mage Ralzeros made the place beyond the gate so hard to reach. 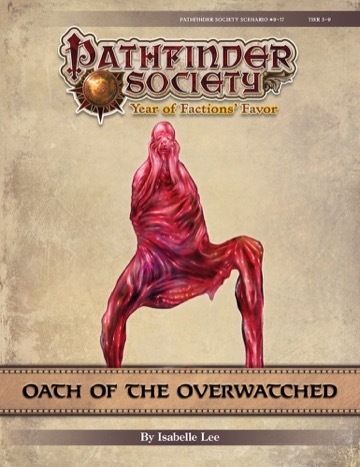 Contents in Oath of the Overwatched also contribute directly to the ongoing storyline of the Dark Archive faction. I'm totally in for this. I'd like to go with the extra crispy tier, I think that's high. Ive got polar opposites available for play in high tier. Either freight train or pacifist.